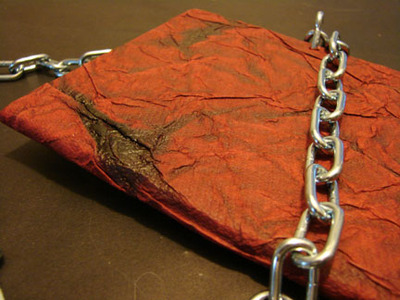 Chains is a book about emotional abuse. Over a third of all women who have had serious relationships have been the victim of emotional abuse (obviously men are victims as well, but most available statistics deal with women in heterosexual relationships). It’s a nasty thing. Because there are no outward physical signs, it can be very easy to ignore or dismiss emotional abuse – to believe that it’s all in your head, or your own fault, or “not so bad.” The problem is, it is so bad. It does seriously bad things to your mental health, is a major predictor of future physical abuse, and is a major warning sign for murder and murder-suicide. This book is about the chains of abuse that bind us, and the chains we bind around ourselves under the mistaken assumption that we are in a loving relationship. It’s also about the chains we lock around that part of our lives so that we don’t have to think about it or talk about it. 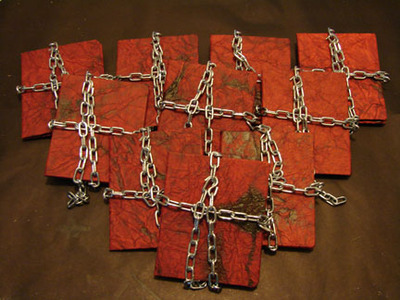 Chains is difficult to open, reflecting on how hard it can be to open up about abuse, and once you’ve got it undone, the chains make it hard to handle – just as we can find it difficult to get a grip on our feelings as we try to process them in the aftermath of an abusive relationship. Finally, once you’ve got Chains open, it is difficult to close back up – a reminder that we shouldn’t try to lock up these things inside us but should expose them to the light so that they can heal and help others. I’ve decided that multiple editions are the devil. It took me so long to do all of these. On the other hand, there’s something deeply satisfying about having an entire little stack of the same book – being your own publishing house. 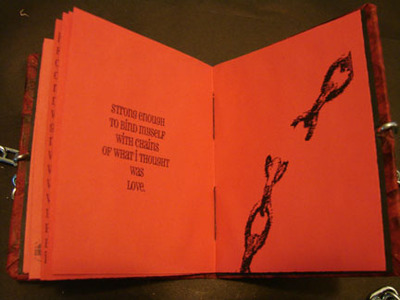 I am so impressed with “real” book artists who do editions in excess of a hundred books… how do they do it? I guess maybe once you’re good at this it becomes like knitting, and you can do it more automatically. That, or they use slave labor. 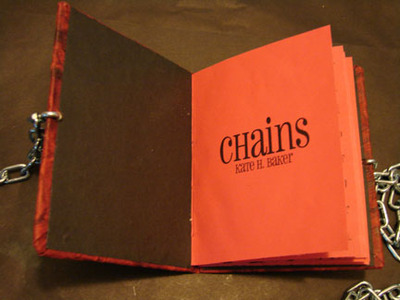 Chains is a multiple-signature book with medium-weight hard boards covered in heavy textured paper (I’d categorize the paper as handmade, but that would be deceptive as I purchased it… somebody had to make this stuff by hand, though) and tied shut with metal chain. The pages are printed on Astrobrite paper using Pharmacy typeface and graphics adapted from a Photoshop brush by Obsidian Dawn. 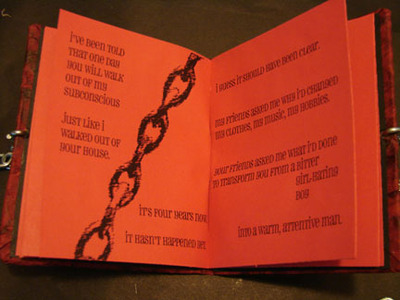 The text block’s design is inspired by the zine aesthetic. 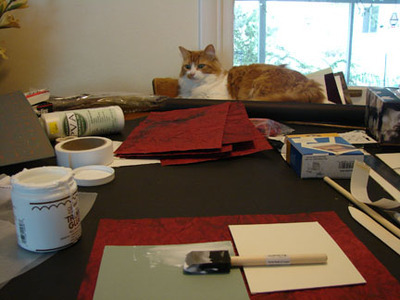 And yes, I used tacky glue – I experimented with a lot of different kinds of glue, and Aileen’s worked best with this paper. Wow! Wow! This is fabulous. Congratulations on a really wonderful book. I hear you about doing editions, too. My first book was an edition of 100 and very complex (lots of pull-outs and overlays) and it just about killed me. The last one was an edition of 25 and my fingers are still calloused from putting the beads on it. It’s definitely a labor of love/hate. LOL!